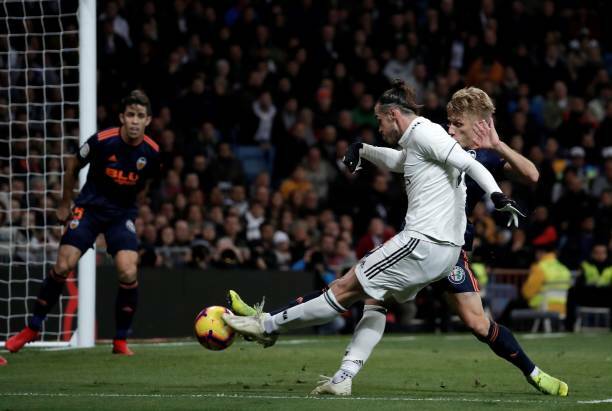 Real Madrid displayed good performance on Saturda to earn a 2-0 win at home to Valencia which allowed them to climb to fifth in the La Liga standings and reduce their recent troubles. Valencia’s Michy Batshuayi was then denied by his fellow Belgian and former Chelsea team mate Thibaut Courtois in the Real goal and moments later, down the other end, Lucas Vazquez sealed a barely deserved yet vital win in the 83rd minute, completing a quick-fire counterattack spearheaded by the tireless Carvajal. The win enabled Real to capitalise on Espanyol’s 3-0 defeat at Getafe and leapfrog the Catalans into fifth place on 23 points, three behind La Liga leaders Sevilla who visit Alaves on Sunday and two from champions Barcelona, who host Villarreal. Real’s mood after last week’s debacle in Eibar had been lifted by a 2-0 win over AS Roma which sealed top spot in their Champions League group. They were missing Toni Kroos, Casemiro and Marcelo though Spain midfielder Isco returned to the squad after a highly-publicised exclusion against Roma but still did not make the line-up. Homegrown midfielder Marcos Llorente was rewarded for his mature display on Tuesday with another starting berth. Llorente provided some much-needed balance to the team which has been lacking in the absence of usual anchor Casemiro, and Madrid controlled the first half without giving their fans much to get excited about besides their opening goal. Valencia came out with renewed energy and spirit in the second half and took the game to Madrid but failed to keep their cool whenever they managed to find an opening. “We are tired after two very demanding games but we’re very happy with the victory.